This is the definition of personal boundaries according to Wikipedia. 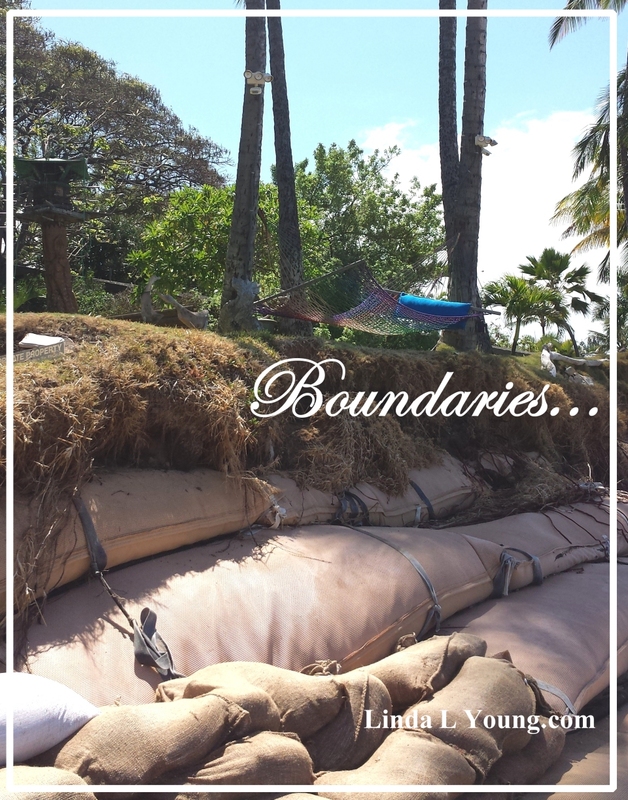 Another way of thinking about boundaries is that of protecting your property and protecting yourself. How you do that is your process. It is sometimes easier to think about than actually do. When people are in your space and talking you down, how do you defend yourself? How do you react to them with out moving down to their level? It takes a lot of practice. It takes a lot of contemplation, self searching, and soul searching. It is always better to “respond” rather than to “react” to other people. When the intensity of the moment, especially when it is perceived that someone else is attacking you, happens, you must act with great resolve in order to stay true to yourself. Hold on to your self esteem, have your boundaries in full awareness. Keep yourself within your desires, rather than reacting to the other person. Some people actually like to cause ripples in other peoples lives. They strive on conflict and chaos. Drama is their mission. That puts them in the control position, making them feel powerful because they are in fact controlling you. It doesn’t seem to matter what the end result is, to these people, they live for the moment, causing whatever conflict they can, being offensive and doing whatever it takes to control the moment. When in contact with this kind of person, you must keep your own personal goals in mind, knowing that this situation is only temporary. If you desire peace and harmony in your life, you have to just side step conflict causers, and move away from them. I used to have a lot of conflict in my life. It seemed to follow me everywhere I went. People would seek me out to be rude to me. I guess I was an easy target for someone wanting to vent their discomfort or anger. I finally figured out that other people’s anger is their problem, and it didn’t have to be mine. I started practicing my own peace and harmony until it was just normal and comfortable for me NOT to have or allow conflict around me. Peace and harmony has become a habit for me. Of coarse you know that the more you practice something, the easier it becomes. I surround myself with kind, harmonious, fun people that encourage and love me. It feels so much better now that I enforce my boundaries, and attract the peace and harmony that I really want. And how would you do this? First it would be helpful if you liked to go to the beach. If you were naturally drawn to stand by the ocean and watch the waves as they mysteriously wash in and out at the urging of the tides. That would predispose the fact that you already feel the power of the waves. That you are one of the many thousands of people that enjoy the cool refreshing mist of the ocean spray on a warm and sunny day. You see that the rocks are wet with mist from the wind blown water, splashing rhythmically against them. You hear the sound of the waves splashing purposely back and forth as they cover and uncover the rocks beneath your feet encompassing the surrounding area, touching lightly on your bare feet, brushing softly against your skin. 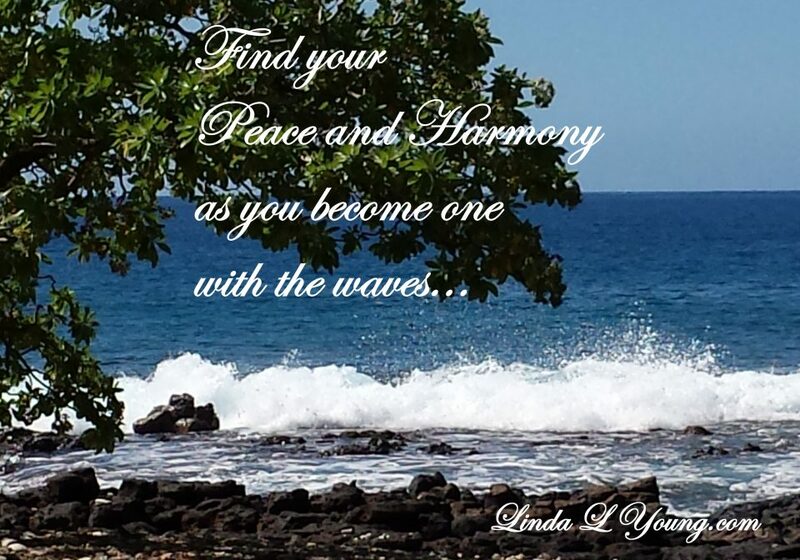 You are now immersed with the feelings of being at the beach and becoming one with the peace and harmony of the waves. As you surrender yourself to all of the local sounds, sights, aromas, and feelings, you become in tune with them. Deeper and deeper you immerse yourself into the surroundings, one breath at a time. Breathing deeply now, you let your eyes slowly come to closure, only hearing, smelling, and feeling your surroundings. Soon you find yourself peaceful and relaxed. Still breathing in, and exhaling out, you allow the waves to become a part of you. Breathing them in, breathing them out. Feeling them calm you and bring you into a harmonious part of your inner self. You are now one with the waves. You are a part of them and they are a part of you. While you are in this contemplative, meditative state you may even want to sing or chant a favorite spiritual song to bring you even closer to nature. The song “Mother Earth” by Navajo musician Sharon Burch is one that you might want to try. The translation comes from Navajo language translator Krystle Seschillie on her blog Navajo Now. The song reminds us that we are a part of a larger cosmic system — whether you call that God, Mother Earth or something else entirely. 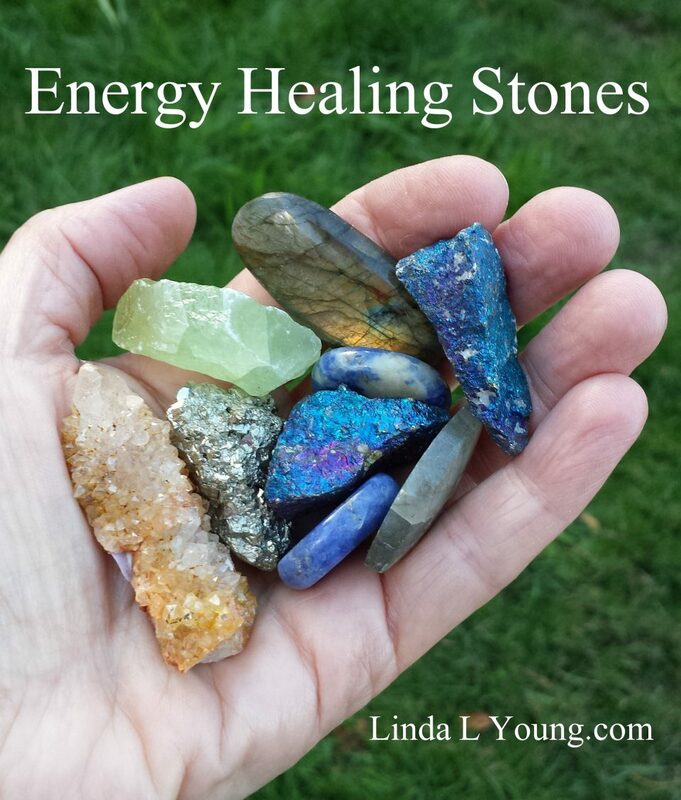 What are Energy Healing Stones?They can be any stone that looks and feels good to you. Stones amplify what you are feeling. They can also help change or smooth over other things that are going on with in your being. The reason they are able to do this is because our bodies are basically made up of the same elements that stones are. Therefore, the minerals in the stones can alter what we are feeling when they are in contact with our bodies. They have a little less influence if they are just in the same vicinity of where we are, but they can still effect us. Have you ever walked by a huge crystal and felt it pull you toward it? It is amazing. You just feel like walking closer to it and standing in it’s presence, basking in it’s good vibrant energy. You find yourself looking at it and examining it from all angles, just wondering why you feel so good standing by it. How does this happen? It is because our bodies are surrounded by an energy field called an aura. The aura is able to react to and with other outside influences. It’s like wearing our feelings on the outside of the body. It is a field outside of the body but still a part of and connected to the body. This field, or aura we wear, can protect us from danger, let us know when angry people are present, and alert us to harmful influences. It can also help us feel love and comfort from other people. The aura illuminates out from the body in layers and is connected to the various chakras in the body and is also amplified by them. If you are feeling anger or are upset for some reason, for example, your liver is probably at a weaker state. Your stomach may be aching, and you are feeling over all stress. Negative emotions tend to weaken our organs and often result in headaches or upset stomach’s. This is one place where energy healing stones can come in as helpful tools. Using or holding the correct stone in your hand can elevate your mood and feelings upward. Even standing in the grass, on the ground, or in sand, in your bare feet can help you feel more grounded and balanced. Our body reacts to whatever is around us. You can learn to use stones and other elements as tools to change and elevate your world. They are here for your benefit if you allow them to be and learn how to use them properly. You are never too old to set another GOAL or to dream a new DREAM. 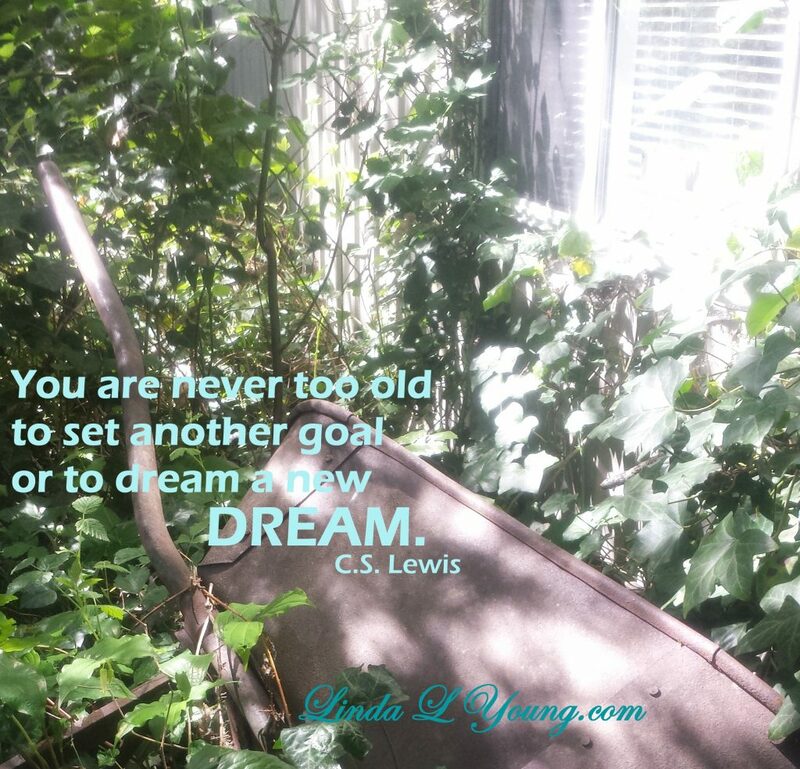 As long as you are breathing, you can continue setting goals and planning new things, including dreams. Don’t ever give up. Don’t ever think you are too old. Many people have started new business’s as late as their 60’s, 70’s and even 80’s. The point is -that as long as you are still breathing, you can still live your life to the fullest – every day. If all you can do is breathe – then do that with all your might. If you can read and breathe, then that could keep you busy full time. Add in a few more things and you can have an even fuller life right where you are right now. I am so thankful that I can still do everything I want to with ease and grace. Age is just a number, I believe. When I start feeling stiffness creeping in, I know that I need to start drinking more water and limiting my sugar intake. It’s pretty simple when you know your body that well. If you are on a few medications, it can be a lot tougher to diagnose. At least a little more to think about. Eating healthy is so important, and so is a healthy mindset. I know that unexpected things happen in life, but really, life is what you make it. Use what you have and make it the best life you can. It’s a little tougher to “practice” what you know to be healthy and for your highest and best though. It’s really hard if you have a lot of cakes, pies, and cookies present. – Right? How do you say no to something that tasty? You just have to eat smaller portions of the goodies and more of the things that have less calories and higher food value, knowing that everything has consequences. The more calories you eat, the more you have to exercise or increase your metabolism some way to stay at your desired weight. If you want to loose weight, eat less sugar and exercise or do more walking and active things. Having a good mindset is also important. Loving yourself helps you find and maintain the perfect weight for you. As you feel good about yourself your weight will shift. See yourself at the perfect weight, and keep that thought in your focus. Life has many flavors. Like ice cream cones, there is a lot of variety. Chocolate, strawberry, and vanilla to name a few. Some flavors you choose and some are chosen for you. It is better if you are handed a flavor that you like, but if you don’t really like what you are handed, you may have to eat it anyway – maybe to save someone else’s feelings or perhaps because it’s all you have to eat. Or maybe because a parent or someone in authority forces you to eat it. However it goes, sometimes we have to swallow a bit of life that we didn’t really plan on eating. There are lots of reasons why we think we have to do certain things in life. Things like eating unwanted ice cream cones. Whatever reason you have for doing what you do, keep in mind that it will be easier if you go with the flow. There are many lessons to be learned in life as we grow up, giving us lots of things to choose from. From frivolous choices like what color and pattern of your favorite silk scarf to wear to the grocery store today, to absolute serious survival mode choices like where to hide quickly when someone is shooting at us, and every kind of choice in between. Life is not always easy so we have to learn to live and grow day to day doing the best we can as we go. It really helps if we have friends, family, and mentors to share their life experiences, helping us learn from the lessons they have already gone through. Good educational resources, books, and organizations that you can join where knowledge is shared and used encouragingly by all. Know how to live in the stream. Permit the great of the stream to me. Know how to take advantage of the all inclusive vitality of the stream. Recognize what it feels like to accomplish huge things effectively and easily. Knowing that I will get what I need, without paying the cost of torment or enduring. I am adjusted to the universe’s inventive vitality. I can discharge the injury of coming up short. 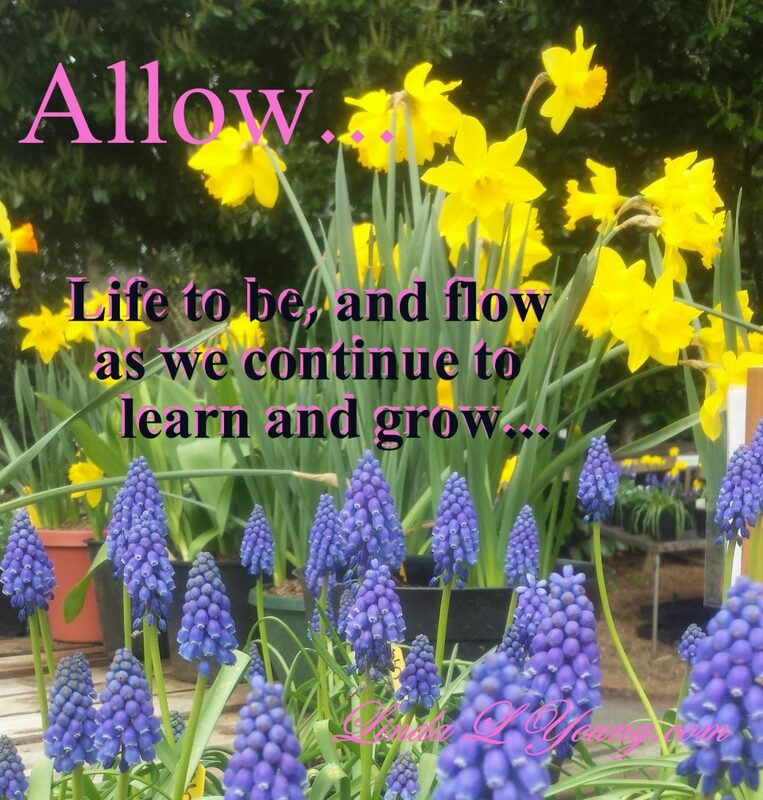 It helps to appreciate the trip, enjoying life along the way, submerging yourself into it and going with the flow of life as you learn and grow. 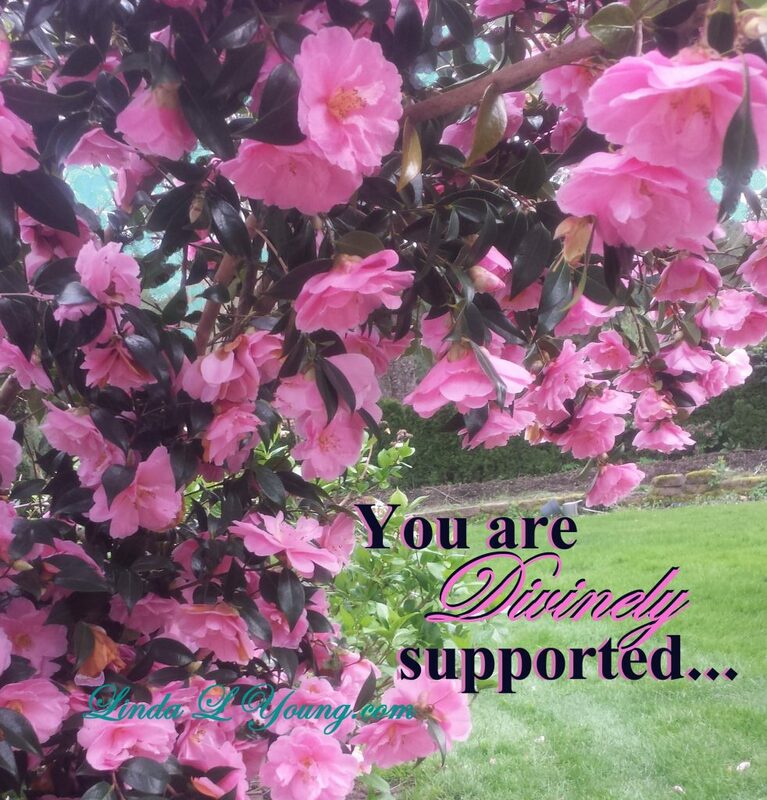 What does it mean to be Divinely Supported? To me it means that there is a Divine Source watching over us that supports us unconditionally. Some call it “God,” some the “Higher Power,” and some other people have other names for this source of substance and support. Whatever you call it doesn’t really matter as much as the knowingness that the presence is there. That there is support available to us with a divine nature. A presence that somehow knows what is best for us and guides us to that highest and best place for us if we allow it. I feel that we all have choices, and we can choose to allow this divine presence to help us, or we can choose to cut off this guidance and disallow it. Some people even believe that we are our own source of higher power, known as “the God within” where we just need to find the awareness to open up to the knowledge we already possess. Whatever you believe is your right and your choice, as long as it works for you and doesn’t hurt anyone else. I still think there is a divine guidance and that it is supportive of me. It is just as real to me as the living, breathing people in my life that support me every day with encouraging words and caring smiles. Both are so important and nourishing to my beliefs and add continuance to my healthy happy life. Just like the supportive branches of the magnolia tree that are strong and built to hold the beautiful flowers, nurturing them in the sunlight and keeping them safe from falling to the ground where they would then be destroyed. The supportive branches keep the bush growing and expanding as it ages from year to year. They also show off the pretty delicate flowers by giving them the frame work to let them shine for themselves, blowing lightly in the breeze. They feel the rain occasionally and take it in as needed to enhance their bountiful existence, also helping them grow stronger. All in all the growing process continues, while healthy green leaves and pretty pink flowers abound and are supported from the branches, as the process of life goes on. I hope you have enjoyed this descriptive writing. Please take time to comment on what you have liked the most or what has helped you and share it in the comment section. I appreciate and welcome your feedback. New growth is so prevalent at this time of year. Every thing seems to be growing and expanding at an amazing rate, especially the grass, weeds, and plants of the forest. Each one finding it’s own place in the scheme of nature’s hierarchy. 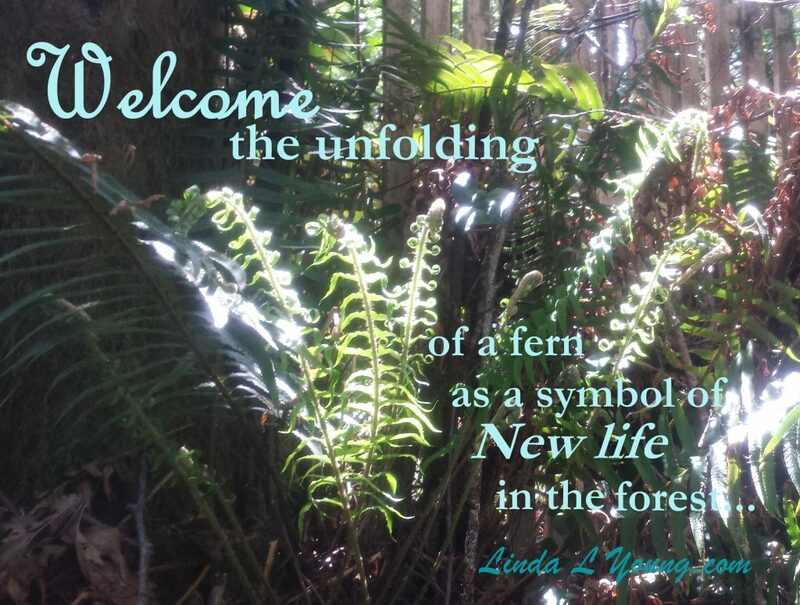 There are numerous varieties and shades of green ferns, unfolding freely along the many winding paths as I walk along. White wildflowers and rich fertile brown soil is being taken over by vines and plants of divine creation. All living in harmony, sharing space within their own confines. Happy and confident that they will have everything they need to keep growing and expanding. Not a care in the world, they just seek the light they need for enrichment, and do what they do, day after day, asking for nothing in return. Their roots stretching forth and reaching down deep into the ground for nourishment. Their stems being fed by the roots and through the leaves. Such is the ever replenishing cycle of life in nature. Each plant starting with new growth, living through the timely span it has been given, and then returning to the ground and enhancing the soil as fertilizer for the next years harvest. Year after year the cycle continues as time goes on. Occasionally there may be a disruption to this almost perfect cycle, however. I have had some medium to large sized maple trees that just fell over for no apparent reason. Perhaps there was too much rain for too long of a period, and the ground got too saturated, giving way to their mighty height and weight. Or maybe they obtained some kind of disease or pests in their bark that made them weak. Perhaps the wind blew too hard one day and uprooted them because they were planted too close to the sharp edge of the bank. Once fallen down, everything under and around them changed. Little plants were uprooted along side of these mighty maples, others were wiped out by the force of the fall, still others were smashed into oblivion. New growth then starts over and begins again. Soon abundance abounds and new life grows all around replacing the damaged, disrupted areas. There are many tools you can use to enhance your life and bring out more depth and authenticity in your journey every day. When asking questions in your daily life practice, using these awesome tools can help you find out what you want to know even faster. It gives you a jump start to where you want to go. Helping you achieve your dreams and goals with more clarity and focus. I like using a variety of tools every day in my own practice. Some of my favorites, are books, crystals, a brass singing bowl, a copper wand, meditation, communing with my higher power, and communing with nature. I get great pleasure out of my world of variety. 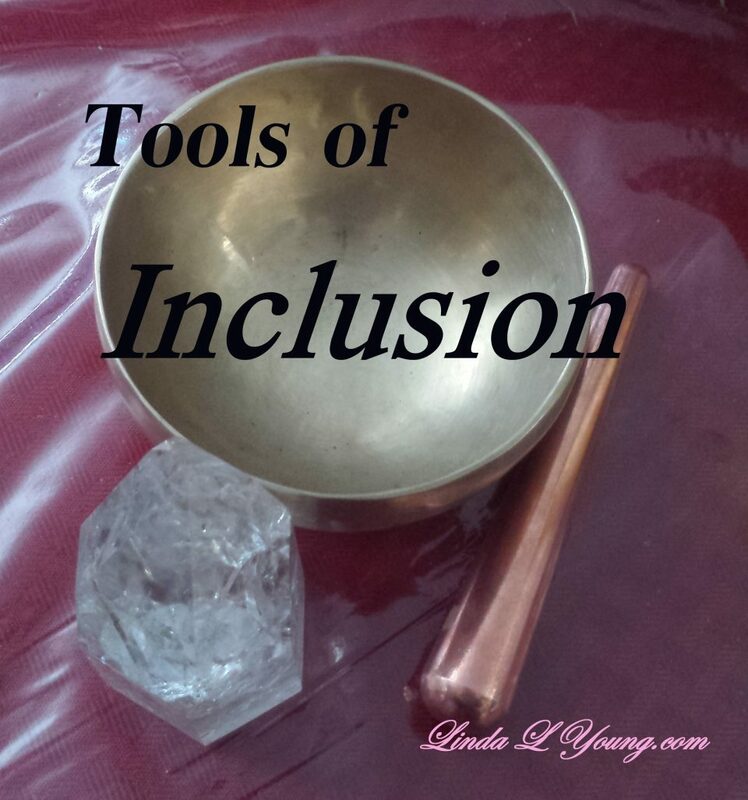 These tools help me become clearer when I have questions about life issues. Sometimes they just provide a security and conformation to what I all ready know deep inside. Never the less, they are fun to use and add a different dimension to the daily grind. If I have a question about a particular issue that I want to know more about, I consult any number of processes to find the answer. Prayer is my absolute best bet, however, sometimes prayer requires more patience than I have at the moment, so I look to more immediate answers like consulting the Bible directly, or look to some of the other spiritual books I possess. Sometimes I consult with my enchanted oracle card decks also, and in no time the answers pop out to capture my attention. It may just be a feeling of comfort that I receive, or a knowingness that all is well in my world. Another fact is that I have a wonderful, prosperous, joyous life filled with love. I let others judge if they want, and I just go about my daily business of feeling good. And see where it will take you. What have you got to loose? You’ve tried and tried to force things along and where did that get you? Usually forcing things gets you a big, giant, pounding, headache to start with, or at least a significant amount of high blood pressure. It also makes everyone else want to run away from your presence, and often leads to more problems than it is worth. Having goals is a different story though. I think it’s really important to have dreams and goals. It’s just that when you get in such a hurry to “make things happen,” you are trying to “force” things ~not~ waiting for every thing to come into alignment where there is no resistance. For example, let’s say that you are wanting to buy a new car. You see one on the car lot that you like and you just have to have it right this minute. “Why wait?” You ask. “Just go for it!” Cash in hand, you purchase that brand new shinny car that looks so good in the moment. After your impulsive purchase, you begin seeing other cars just like the one you bought. Same brand, same color, same year, everything the same. Then, with a little research, you find that you paid a lot more money than some other people paid for the same vehicle. Not only that, but you could have kept your cash and made monthly payments with a down payment, and 0% interest. That would have left a lot more cash in reserve for some of the other things you might need or want, ending up being a lot easier, in the long run. So you think you were following the path of least resistance, just going with the flow, (actually your impulses) and purchasing something that you wanted. All good, except that if you really had followed the path of least resistance, you wouldn’t have ended up with any major problems. If you had just taken a little time to research your purchase first, the “Flow” would have gone a lot easier, and the results would have been more in your favor. 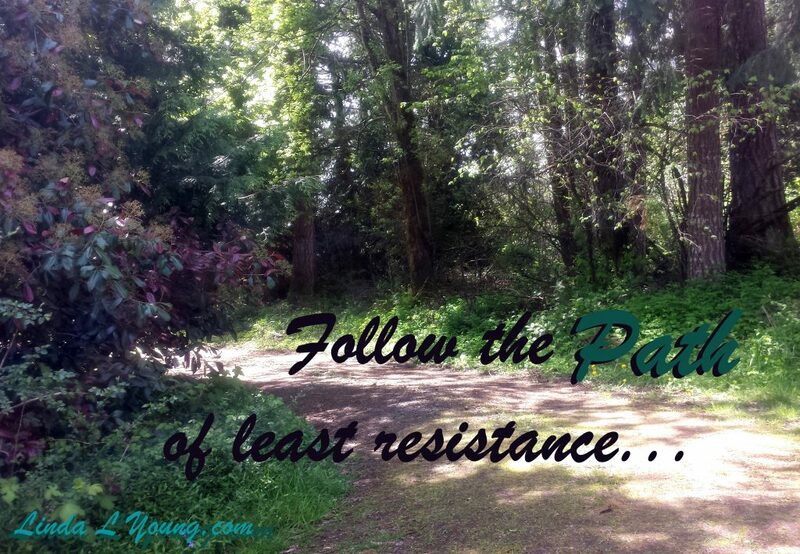 When you fight against yourself, or any one else, for that matter, you are causing resistance rather than going with the path of least resistance, Every time you say no to something, you are resisting it. While a beautiful yellow rose starts out only as a little green growth on a rose bush, and is exposed to enough time and appropriate temperature, ample water and proper nourishment, the little green growth grows into a mature rose bush, sending out the likeness of a stem. Where once only the thought of a rose existed, now a tight little yellow rose bud appears. Compact and condensed, it is still hiding itself from the world around it. Keeping itself in a safe undisclosed secret place, learning and growing, protected from the trials and tribulations surrounding it. From the cruelty and neglect of the nearby meta forces, it holds it’s space for the moment. Later, after more maturity and growth, the little yellow bud launches itself freely forward into the fullness of Love where it produces and provides fulfillment into the lives of those who see and enjoy it. Spreading the sweet smelling fragrance of aromatic essence to expanded proportions, exuding itself into complete ecstasy of unrequited passion and purpose. Low and behold, life goes on swinging from the trees of togetherness, perfection abounds. As the dew drips slowly down the soft curvature of the petals flowing through the creases, making its way to the edge where it wells up into a tear drop shaped explosion of sacred knowingness. The rose blooms and expands into its fullness, opening itself up to the fullness and completeness of Love. 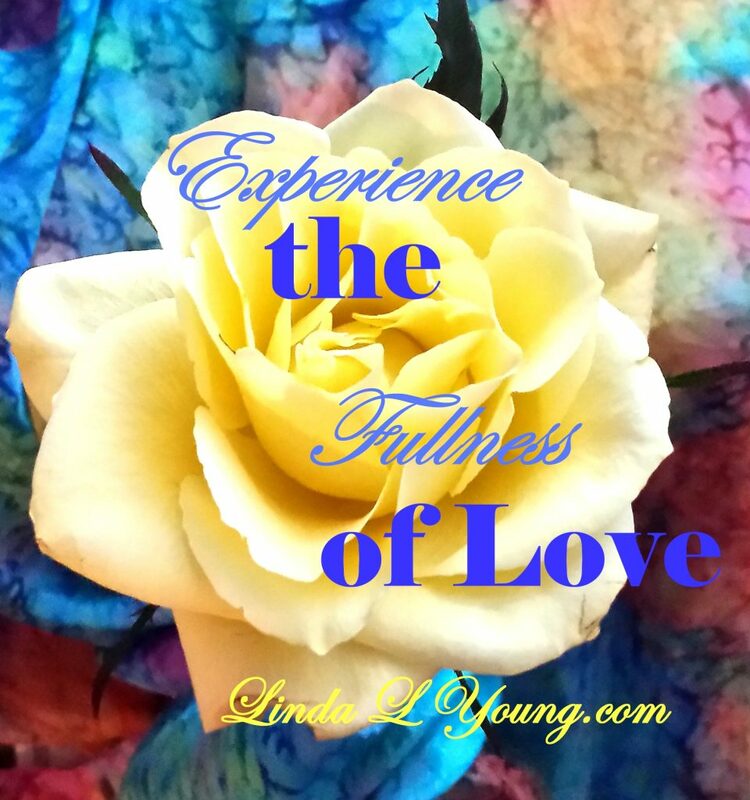 It is only as you relate to this metaphor that you understand the possibility of allowing the fullness of love to reach its full potential in your life.